If you’re in the marketing industry, Google Analytics is most likely your best friend. Landing page performance, sessions, traffic sources, conversions, conversion rate, and bounce rate are concepts you’re familiar with, but do you know how to present these key metrics in the best way possible? 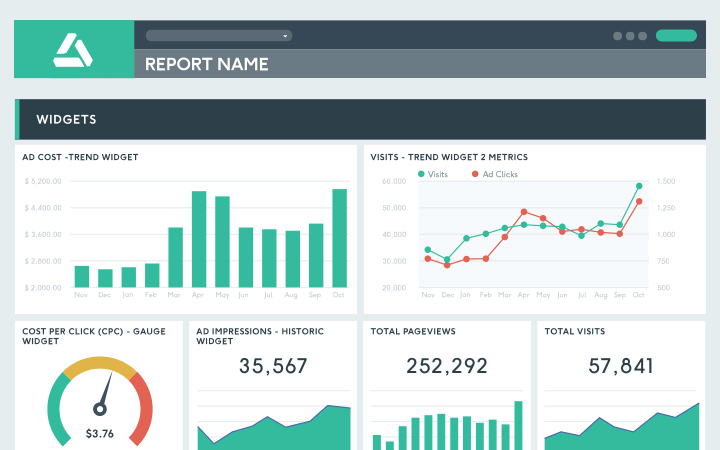 DashThis is the analytics reporting tool that’s about to change how you and your clients perceive analytics data. We get it: creating new custom reports every month is not your favorite part of the job. This is why DashThis has created a Google Analytics report template for you to start using right away! Add your logo and your most valuable insight, and your done! A simple automated reporting process is exactly what our analytics reporting tool has to offer. Enter your Google Analytics credentials, add any other data source you want in your report (social media, PPC, SEO, etc.) and let us do the heavy data visualization lifting part! Spread the good news! Use our Google Analytics reporting tool to send emails with a link to the web version or an attached PDF version of your report, protect it with a password if you want, and make sure your report gets the visibility it deserves. As one of the first analytics reporting tools on the market back in 2011, DashThis has built up a significant wealth of knowledge over the years, leading to a deep understanding of our clients. Some of those clients have been with us since the very beginning, and have stayed as we have evolved with the market. Today, we’re praised by thousands of small businesses and marketing agencies from all around the world who benefit from this strong experience on a daily basis. Of course, all Google Analytics reporting tools are expected to provide the basic features, but what about features that guarantee to take your reporting game to the next level? This is exactly what DashThis has to offer. With our Google Analytics reporting tool, you only pay for what you need. Our pricing model is based on the numbers of reporting dashboards you use. Everything else, from all of our integrations, to the unlimited number of users in your account, to your very own dedicated account manager, is included. Replace the default DashThis URL by one that’s branded to your company, like reports.yourcompany.com. Let our designers work their magic to reflect your brand’s colours, fonts, and overall vibe. Get a discount on your white label dashboard by choosing both the custom report URL and design. Your clients’ websites undoubtedly involve a whole lot of google analytics data you need to constantly keep track of. With a Google Analytics report template, gather all your clients’ website data in a single, nice-looking Google Analytics report and start reporting in no time! Read our blog to learn more about Google Analytics reporting! Can’t get enough of Google Analytics reporting? With brand new content added on a regular basis, our blog is THE place to be. Why don’t you sign up to our newsletter to get the latest info while you’re at it?